Searching for a friendly female? Humpback whales form lasting bonds, the first baleen whales known to do so. Individual female humpbacks reunite each summer to feed and swim alongside one another in the Gulf of St Lawrence, off Canada, scientists have found. Toothed whales, such as sperm whales, associate with one another, but larger baleen whales, which filter their food, have been thought less social. The finding raises the possibility that commercial whaling may have broken apart social groups of whales. Details of the discovery are published in the journal Behavioral Ecology and Sociobiology. Dr Christian Ramp and colleagues of the Mingan Island Cetacean Study group based in St Lambert, Canada have been studying whales in the Gulf of St Lawrence since 1997. Together with researchers from Germany and Sweden, the scientists are recording the movements of baleen whales including blue, fin, minke and humpback whales, adding to a set of data that stretches back 30 years. Where do they meet, and how do they recognise each other? Baleen whales, which are the largest of all whales, possess huge baleen plates in their mouths, which they use to filter out small prey such as krill and plankton from the water. Using photographic identification techniques, the researchers can spot which individual whales appear from one year to the next. During this study, they have found that the same humpback whales reunite each year. Having spent the rest of the year apart migrating and breeding, individual humpbacks somehow find each other again in the open ocean each summer, spending the season feeding together. The longest recorded friendships lasted six years, and always occurred between similar-aged females, and never between females and males. "I was very surprised by the prolonged duration," Dr Ramp told the BBC. "I was expecting stable associations within one season, not beyond. I was particularly surprised by the fact that only females form these bonds, especially females of similar age." The discovery has puzzled the researchers who made it. "In toothed whales, you find strong bonds in killer whales, between entire families, and sperm whales between females and juveniles. They basically stay together all their life. There are also strong associations in bottlenose dolphins," Dr Ramp adds. But "as far as we know, baleen whales are regarded as less social than toothed whales." There is some evidence that humpbacks in Alaska form stable groups to feed on herring, and female right whales are thought to be more gregarious than males. However, until now, baleen whales have not been known to reestablish bonds between individuals from one year to the next. Forming such friendships clearly benefited the female humpbacks, as those that had the most stable and long-lasting associations gave birth to the most calves. Dr Ramp and his colleagues suspect that the whales form bonds to improve their feeding efficiency each year. "Staying together for a prolonged period of time requires a constant effort. That means that they feed together, but likely also rest together. So an individual is adapting its behaviour to another one." How the whales find each other each summer is also an enigma. "It's an excellent question and I would like to know the answer," says Dr Ramp. "Where do they meet, and how do they recognise each other?" 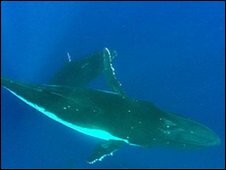 He suspects the whales use sound to find and recognise other individuals. So far, studies on blue and fin whales suggest that these species do not form such friendships. 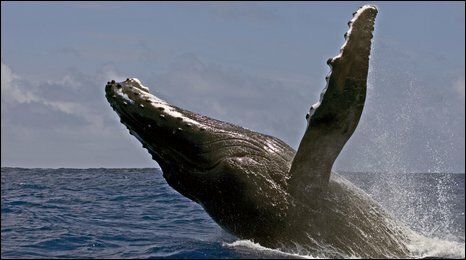 But the discovery that humpbacks do might have further implications. Dr Ramp speculates that humpback whales associating with one another may have made it easier for them to be caught in the past by commercial whalers. As yet, there is no evidence to support this. But if that did occur, it would also mean that whaling may have removed social groups of humpbacks, and their preference to form friendships with other whales. "Maybe the social traits are re-evolving due to rebounding populations, or they are completely different to the ones before, due to changes in the environment."